Around the same time we started playing around with sugar beets we also discovered sorghum syrup. 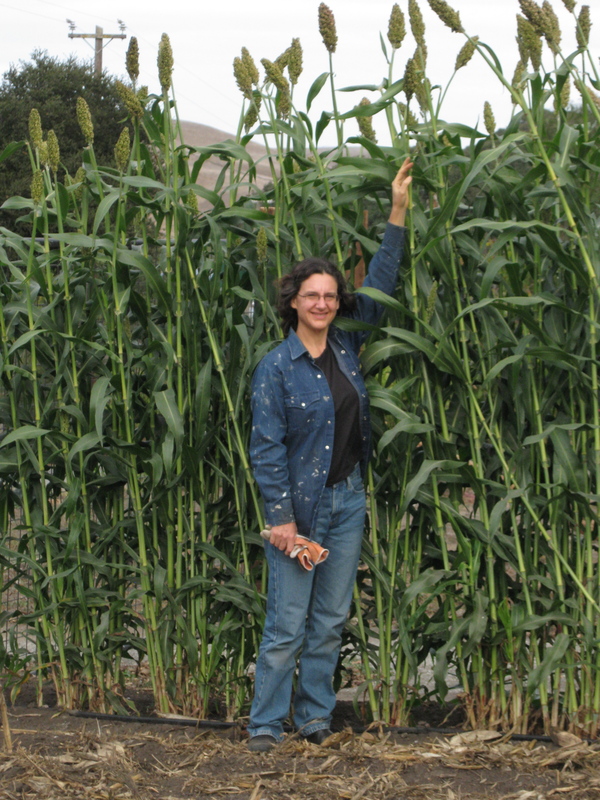 Sorghum species are cultivated worldwide for multiple uses – human and animal feed, alcohol, biofuels, brooms – and some varieties have been bred to have high sugar content in their sap. These are processed similarly to sugar cane, and are used to produce sorghum syrup – also called sorghum molasses* or just “sorghum” in some regions. 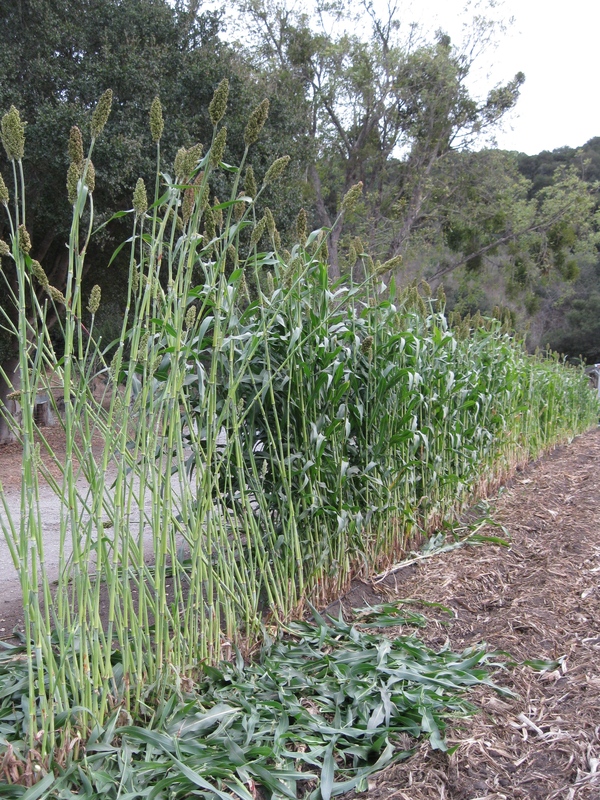 Neither of us had tried or even heard of sorghum syrup, which is more commonly produced in the south-eastern United States, but that didn’t stop us: we planted a nice 100-ft bed of sweet sorghum and promptly got busy with other projects. There was lots of time before harvest to figure out the processing steps… most importantly, we had no idea how we were going to press the juice out of these plants. This is the only photo I took of our main field that year (2012). The bed furthest to the right in this photo was planted to two varieties of sweet sorghum, Topper and Rox Orange (from seedman.com). Photo is from early June, about a week after planting. The Topper had poor germination, and a second planting of it did equally poorly. Fortunately the individual plants produced plenty of tillers and filled in the gaps fairly well as the season progressed. We found information about sweet sorghum production and processing in a University of Kentucky Cooperative Extension publication, and also got valuable information from a coworker who had participated in sorghum research trials in the past. We also used information from this report from the Kerr Center for Sustainable Agriculture and this Mother Earth News article. In writing this post I also found a whole forum devoted to sorghum and cane syrup makers, and also the Southern Sugarmakers Association, both of which appear to have useful information. Once the plants headed up we started to monitor the seed maturity and sugar (Brix) levels. Some sources say that sugar yield is maximized by deheading the plants when the seeds reach the milk stage, and that this can help prevent lodging as well. However, they also say that sugar content continues to increase right up to harvest, so there may be an advantage to pushing the deheading time back. In addition, deheading too early can be detrimental because the plants may start to put their energy into making new seed heads. Measuring °Brix with a refractometer. We cut the seed heads and peduncles off the plants a week before the pressing date. In some varieties it is best to cut at least two nodes from the top, but we were feeling greedy. 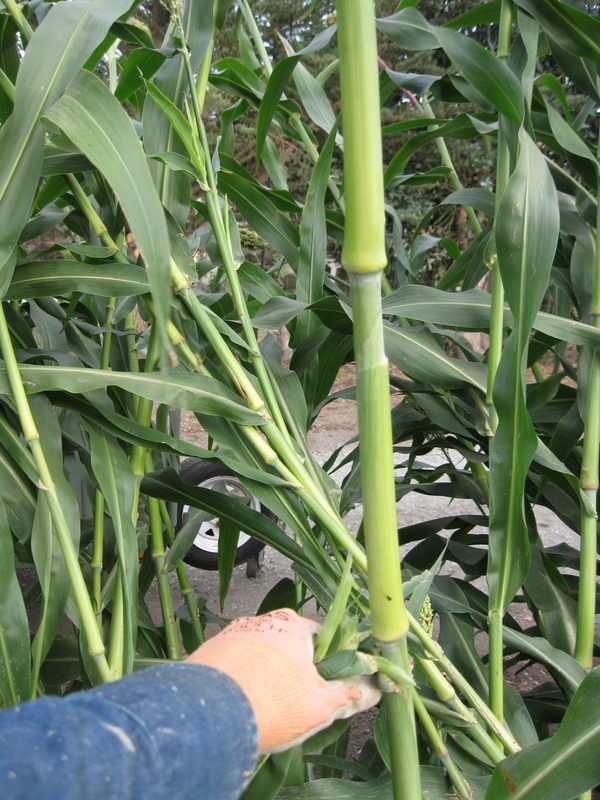 During the processing we found that most of the sugar was in the bottom, thicker parts of the stalk – so in retrospect cutting a shorter stalk might not result in much yield loss. We saved the heads to feed to our chickens; being able to use these as chicken feed is another advantage to deheading later rather than earlier. However, our chickens, being picky, were not very interested in the immature seeds, so we ended up composting most of the heads. We also stripped the leaves off the plants, which helps improve pressing efficiency and prevents off flavors in the syrup, and then stacked the stalks for processing. The stripping process. Seed heads not yet removed. Stacking the stalks for processing, with seed heads collected for chickens. In the week between deheading and pressing, Jim quickly designed and built a sorghum press. We had an old trailer sitting around that needed new wheel hubs to make it road-worthy, so he removed the old hubs, welded them onto a frame, welded on a handle, cleaned it all up, and voilà! a sorghum press. Here’s a video that shows the stripping and pressing process, in which my mom and 4-year-old nephew are doing all the hard work. After pressing all the stalks, we filtered the raw juice through cheesecloth and then let the liquid sit for an hour or so to settle out the starches. We then poured off all the non-cloudy liquid and boiled it down for about 6 hours, stirring it constantly to enhance the evaporation rate and keep it from burning. The goal was to reach 78-80 Brix, or 226-230°F. 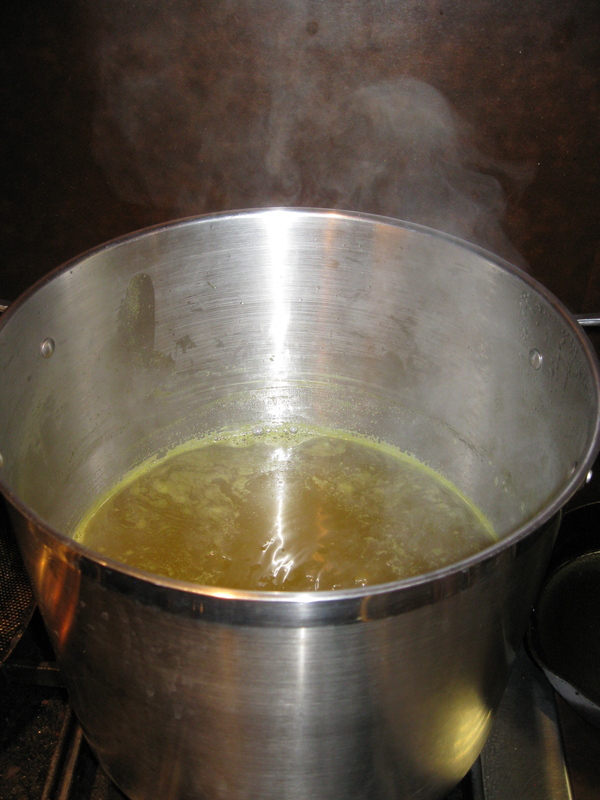 I could not get the temperature to go higher than 224°F; at that temperature, any further cooking caused the syrup to boil wildly, seeming to lose very little more steam, so I decided that it was done at that point. These photos are from 2013, the second year we did this process. In the first year we found that Topper had a higher Brix reading than Rox Orange (19 vs 16.5), so despite the issues we had with initial stand, we planted only Topper in the second year. We planted with our new Jang seeder, and made two passes over the bed with the seed spaced at about 2 inches. The stand was fine in this second year, and we ended up with plants at 21° Brix. 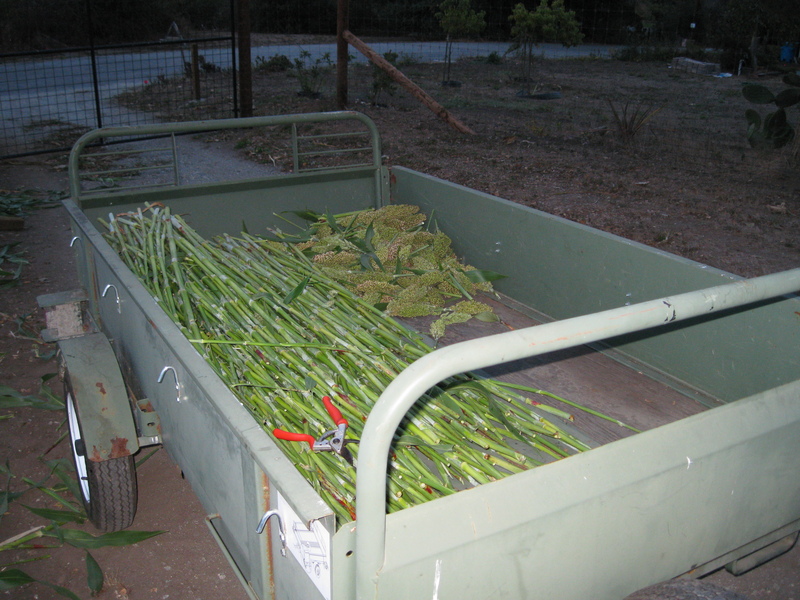 From a single 100-ft long bed of plants we extracted 2.75 gallons of raw juice and ended up with 2.75 quarts of concentrated sorghum syrup. 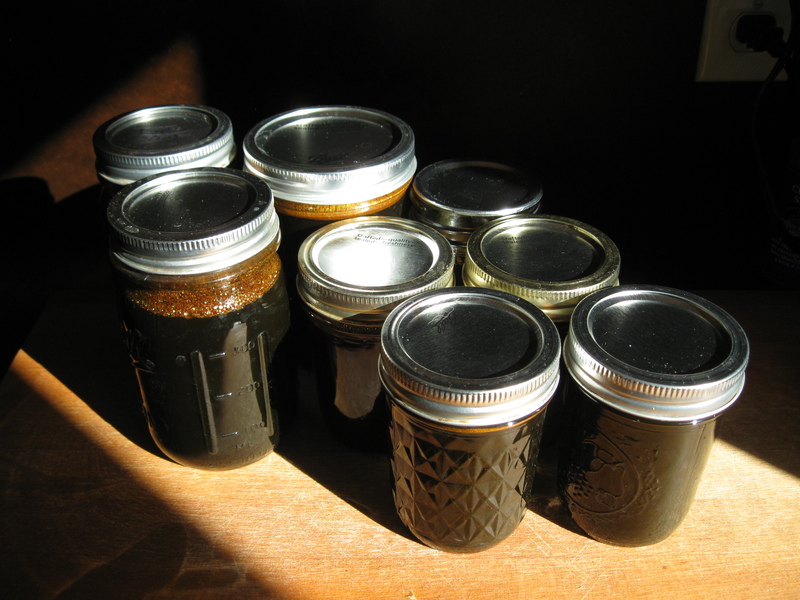 The final syrup seemed more concentrated than the previous years’ product, and was quite delicious. We ate it on cornbread made with our home-grown corn and eggs, and on pancakes and just by itself. 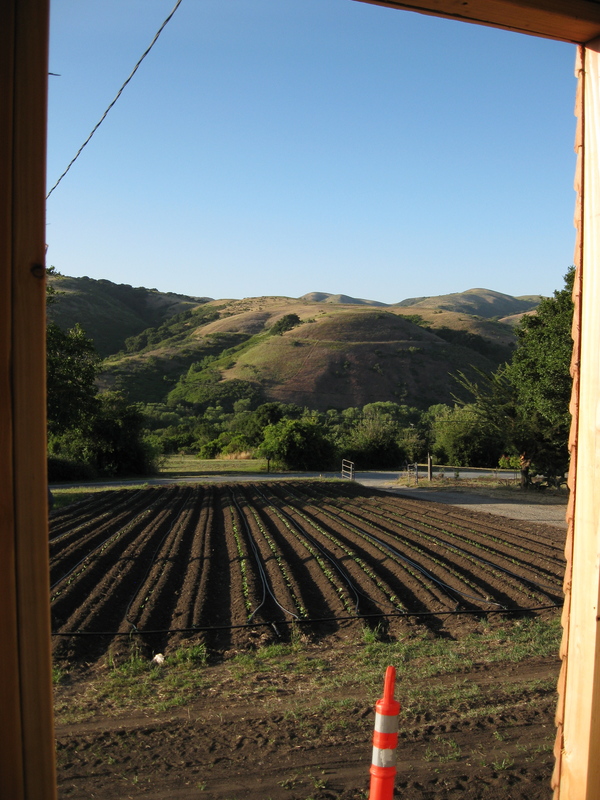 We will definitely try this again, once we are feeling a little less stingy about water use (in California, after 4 years of drought, we are currently very selective about what crops we are growing). However, is clear that if we were serious about this process we would need to make a couple of improvements to our system. Most importantly, we need to modify our extraction system to not only press more thoroughly but also to catch the liquids more completely. Secondly, we need to set up a better evaporator, something with more surface area and an easier way of circulating the liquid – and preferably using wood as a fuel source. I look forward to years of more rain in which we can do this! *The finished product is not technically molasses, which is a term that refers to a byproduct of sugar production from sugar beets or sugar cane. We are looking for Sweet sorghum seeds, do you sell or can refer us to any others? We don’t sell them, but you can get them at http://www.seedman.com/sorghum.htm or https://sustainableseedco.com/products/heirloom-grain-seed-sorghum-seed-sugar-drip-sorghum.